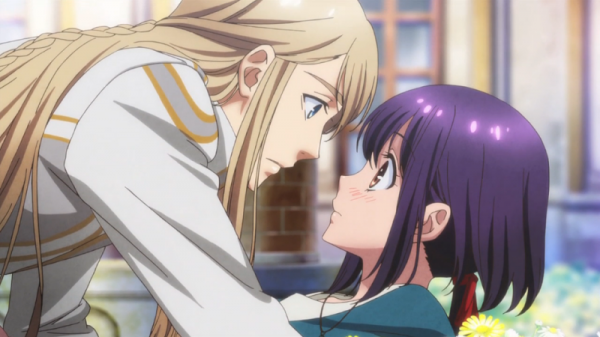 The spring anime season this year brought in quite a few interesting and different series. There was Soul Eater Not! the prequel of Soul Eater. Selector Infected WIXOSS where card games have a Madoka complex. There was also the cute little One Week Friends, that I couldn’t help but aww at. But none of these are what I’m tackling today. Instead, I’m going to be pulling out a review for another visual novel adaptation just like I did with Diabolik Lovers. This time, however, we’re dealing with the Gods rather than vampires. 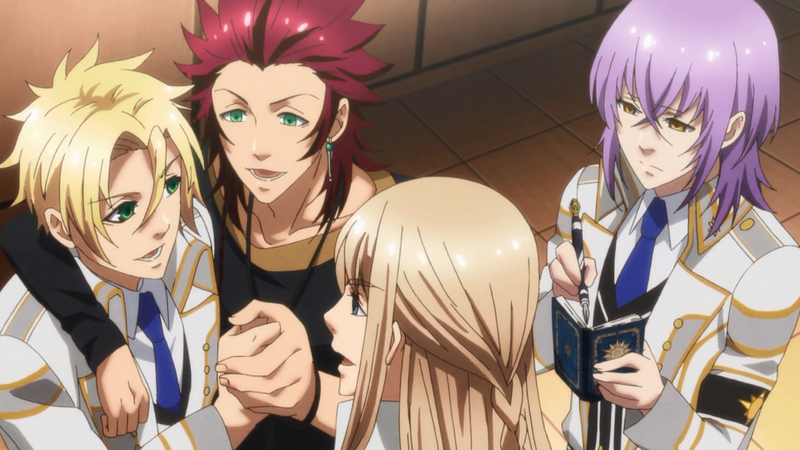 Kamigami no Asobi (AKA Weaving of Fates) is a 12 episode Romance/Supernatural series based on the visual novel from Nippon Ichi Software. The series from director Tomoyuki Kawamura and Brain’s Base studio aired during the Spring 2014 season. 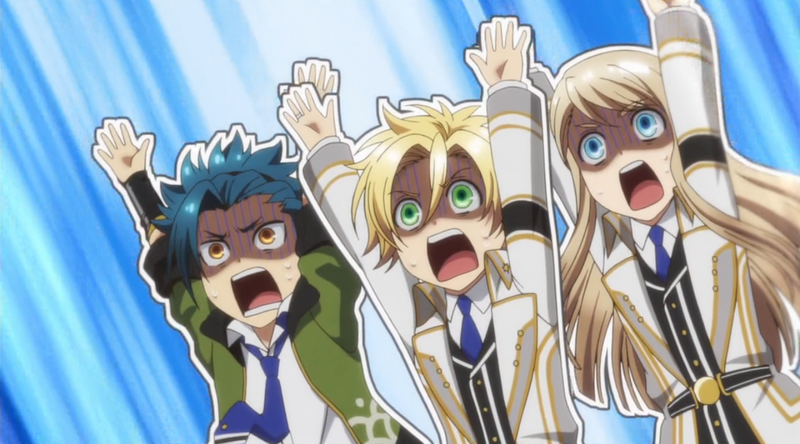 As of this review, Sentai Filmworks (US) is the only licensor of the series. Yui Kusanagi, is the daughter of a Shinto shrine. One day, she discovers a mysterious sword in a storeroom, and is transported to a different world where she meets the Greek god Zeus. He invites her to attend a school in a separate world that he created. She is ordered to teach the meaning of love to eight young and handsome gods. 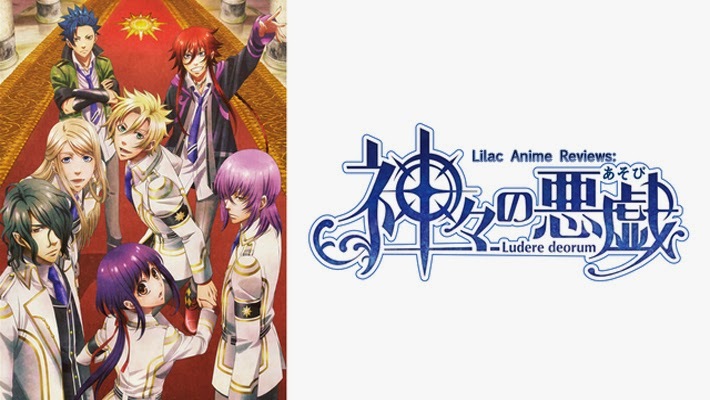 The Greek gods Apollo, Hades, and Dionysus; Norse gods Baldr, Loki, and Thor, and Japanese gods Susanoo and Tsukiyomi. The reason he has for doing this is to cancel the negative effects of the weakening bond between the world of the divine and the world of the humans. In order for Yui to return home, she must lead the gods to graduation and help them understand the human heart. But, of course, things can get rather complicated. Brain’s Base, you’ve done it again! You made a nice looking series! 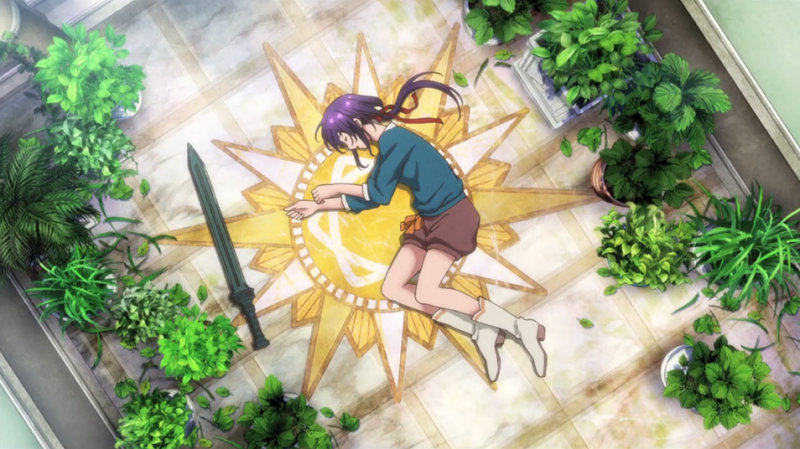 The world of Kamigami is really colorful and pretty, though it makes sense since Zeus created the place and would probably want it extremely nice looking. 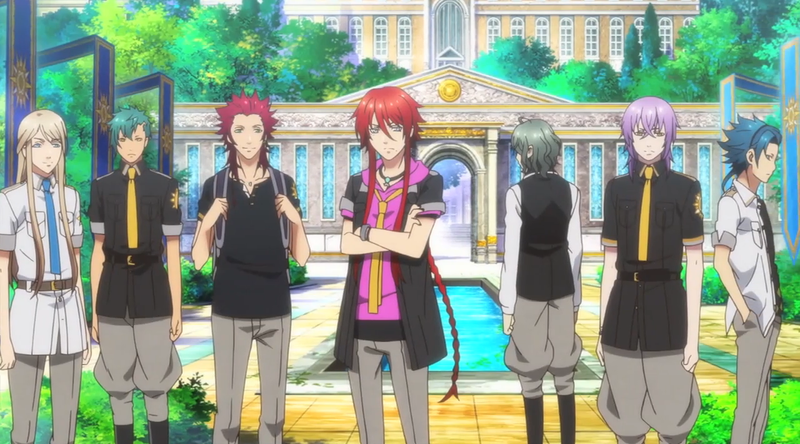 The vibrant color scheme gives the world a much more magical feel since this is a school for a bunch of gods. 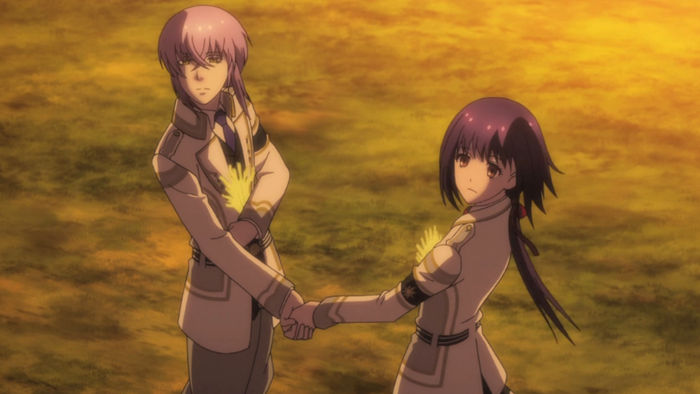 Otherwise than that, there isn’t really anything outstanding or rather noticeable about the animation. The soundtrack is what you expect it would be, a mix of your typical slice of life and romance series but slightly catered to a more heavenly atmosphere. The opening and ending themes were also you standard harem themes with the six voice actors playing the major god roles taking on the theme performances. There’s no denying it, this is a visual novel adaptation. The story pretty much goes like this: we get introduced to our characters and our heroine brings them together, we spend time with each of the gods (minus Dionysus and Thor), and then the climax happens and we end the series. It’s as typical of a VN adaptation as you can get, and it knows this perfectly well. With that in mind, this series is actually rather fun. Because it’s not trying anything new or life changing, it gives more focus elsewhere rather than trying to make a better story. We get to experience high school life, but with gods in tow. As dumb as an idea this is, it’s actually rather funny! Thanks to the god’s misinformed understanding of humans, it creates some of the most amusing moments of the series. Whether it’s not understanding how human bodies work or believing a trashy magazine has creditable information about humans, there was no way I couldn’t stop laughing! ......It was actually rather hard not to laugh while marathoning the series on an eight hour bus ride. During the latter half of the series, we get the build up to the climax and it’s actually done fairly well. It helps that we get a two part episode before we reach the final episodes as a mix of development and exposition. As for the end of the series, it finishes itself nicely and I can’t help but want at least a little more. Mostly because I think it would be funny! Throughout the series, we’re given the chance to get to know Yui and the rest of the gods thanks to individual episodes that are dedicated to them and their various problems. Dionysus and Thor don’t have this luxury, however, because they are not the focus of the series. The other six gods: Apollo, Hades, Baldr, Loki, Susanoo, and Tsukiyomi each spend some time with Yui in one way or another. But, this also varies a bit with some characters getting one episode while others, particularly Balder and Loki, getting a bit more time. There is one thing to look out for and that’s some parts of the mythology is different. Apollo, Loki, Baldr, and Susanoo’s stories in the series are a little bit different than what their respective mythologies claim. It may make those who are unfamiliar with their tales to believe them to be the truth. Just remember that this is an adaptation so everything isn’t going to be all that accurate. Yui’s character isn’t 100% your stereotypical VN heroine. She is capable of holding her own, even against Zeus. There are qualities she has similar to other VN heroine’s, but Yui does at least have a little bit more than they do. Otherwise than that, the character development is what you’d expect from this kind of adaptation with much the characters taking various stereotypes we’ve come to know in VN settings. Once again, nothing new going on here. 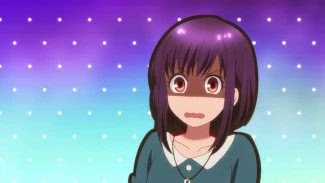 The Japanese language track is pretty solid for a VN adaptation. Leading the pack is Saori Hayami (Eden of the East, Red Data Girl) as Yui whom I think did rather well in order to carry the character in the series. Some fun performances I like include Miyu Irino’s (Captain Earth, D.N.Angel) Apollo, Toshiyuki Toyonaga’s (Tokyo Ghoul, Durarara!!) 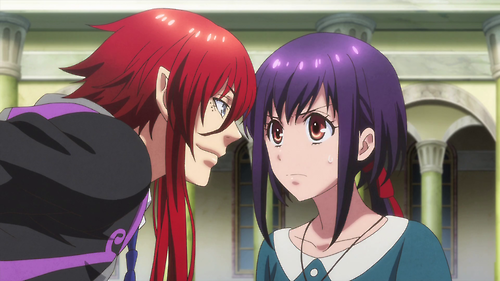 Takeru (AKA Susanoo), and Yoshimasa Hosoya’s (Haikyu!, One Week Friends) Loki. Each one manages to bring a mix of fun and cheerful with a little touch of problem city. 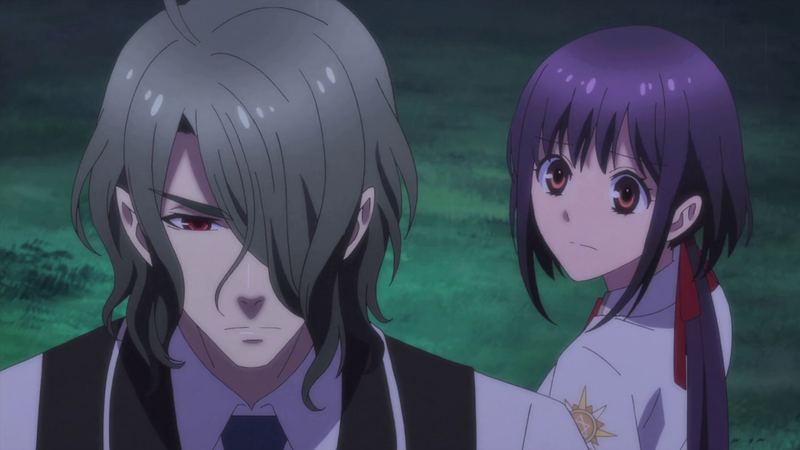 Daisuke Ono (Black Butler, Noragami) takes on Hades, which was probably one of the more hilarious performances of the bunch, especially when he tries to put himself out there for Yui. Hiroshi Kamiya’s (Attack on Titan, Karneval) Balder is also cheerful mixed with problems, but I actually didn’t enjoy the performance as much as Irino, Toyonaga, and Hosoya. Yuuto Uemura’s (Monster, Mushishi: Sequel Chapter) Tsukito (AKA Tuskiyomi) was the weakest out of the main bunch, I feel. But I do understand that the characters do try to fit their respective stereotypes in some form or another with Tsukito being the more quiet, intelligent type. Other fun performances include Hirofumi Nojima (RahXephon, Yowamushi Pedal) as Dionysus, Noriaki Sugiyama (Fate/Stay Night, Hetalia) as Thor, Toshiyuki Morikawa (Beserk, Last Exile) as Thoth, and Daisuke Sakaguchi (Baccano!, Welcome to the NHK) and Houchu Ohtsuka (Blood+, Sasami-san@Ganbaranai) as Zeus. 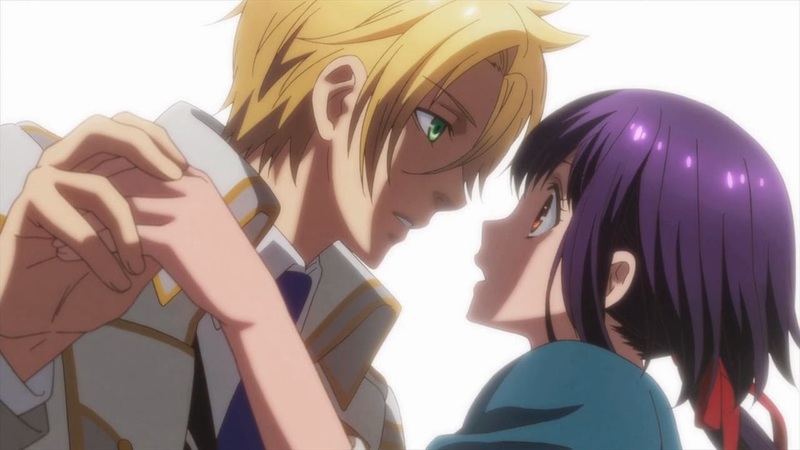 By the time we graduate, Kamigami no Asobi is your typical visual novel adaptation that manages to have some fun. The animation is colorful, the humor is fantastic, and it doesn’t mind being the adaptation that it wants to be. Though the story is average and the characters can be rather cliched, I enjoyed this series more than I thought I was going to. Ladies, you’ll probably love the series and some of the guys in there so give it a go! Guys, this is more of a series for women but you may enjoy some of the dumb humor in it. I’d give it an episode or two before deciding to go further. Next time, I review the most popular anime of 2012... That I didn’t really enjoy all that much.... Until then, otaku on my friends! Final Rating - 6/10 It knows what it is, and it’s not afraid to show it!